Thinking big suits Anna Thorvaldsdottir. Celebrated for her orchestral endeavours, the second edition of Njord Biennale let the Copenhagen audience encounter the Icelandic composer’s works for smaller ensembles. Andrew Mellor on Saturday’s double concert. Orchestras are excited about Anna Thorvaldsdottir. Four months ago in London, her work Aeriality came near to upstaging the last two symphonies of Jean Sibelius when it opened the Philharmonia Orchestra’s season. In April, the New York Philharmonic will give the first performance of her latest piece for large orchestra, Metacosmos. The very day she arrived in Copenhagen as composer-in-residence at Njord Biennale in January, it was announced that she would immediately take up the same position at the Iceland Symphony Orchestra. Thinking big appears to suit Thorvaldsdottir. Interviewing the composer at Koncertkirken on Saturday, Torben Sangild compared her works to large woven rugs. In response, she described how procedures, patterns and structures found in nature help her to work her material, making it vibrate and transition organically – nature not so much as an aesthetic inspiration as a technical one. Aeriality is a classic example: a giant tapestry in which each instrument does its own thing on its own terms, contributing to the swirling stasis of the bigger picture. Despite that, or maybe because of it, Thorvaldsdottir’s works are easy to associate with landscape – particularly with the dramatic, treeless, black-rock terrain of her own Iceland. Deep, tectonic pedal notes in her scores emphasize that idea, particularly when they appear to resound underneath glinting horizons. As in Iceland, light is a precious commodity in Thorvaldsdottir’s music, partly because she’s so incredibly adept at varying the degrees and forms of darkness using astute combinations of instruments at similar pitches (‘nature tells you that brown is never just brown’, she said to Sangild). At Njord, we had a chance to hear Thorvaldsdottir on a smaller scale: from the lone cello of Transitions (2014) to the fourteen instruments of Hrím (2009/10). I remain convinced, however, that the more varied or broad the ensemble, the more interesting creations it draws from this composer. That is connected to her ear for instrumental combinations but, more importantly, to an extension of the same thing: that where function controls form, there is more structural potential the more textures are available. So it appeared at Njord. Hrím was beautiful, seductive, inevitable and reassuring; Transitions felt like a study, a dissection. Hrím was written as a companion piece to Ligeti’s Chamber Concerto from 1969-70 and both works were performed by Finnish new music ensemble Avanti! at the Royal Danish Academy of Music’s Studiescenen on Njord’s penultimate evening. There are obvious parallels between Thorvaldsdottir’s taut narrative and Ligeti’s, in which tension spreads outwards from a single note, colour is both controlled and controlling and instruments of a similar register cleave to one another. In Hrím, impulses spread through the ensemble towards pronounced structural events (the Icelandic title refers to the gradual growth of ice crystals). One of them, a room-stilling open chord of two notes, resounds just under four minutes in, pregnant with tension. Another sees a coalition of low instruments blossom outwards together with dark, heaving severity. If you’ve heard Innova’s recording of the piece from the Icelandic ensemble Caput (available on Spotify) then this performance under Clément Mao-Tákacs was something different entirely: more contained yet more wind-blown, those gestures more successfully subsumed within the bigger picture. From what we know about Thorvaldsdottir and what she said to Sangild, we could conclude that it was a performance closer to her ideal. There are characteristic flickers of lyricism in Hrím, as when the violin uses a little melody to charm the cello into a coiled embrace. There is Thorvaldsdottir’s consistently careful, discriminating use of quartertones (often accessed via a moaning glissando). But the ‘tune’ of the piece, really, is measured from its beginning to its end. Where Ligeti’s chamber concerto plays with tradition in its deceptive search for musical and/or mathematical resolution, Thorvaldsdottir’s eventually takes its leave with a nonchalant glissando – everything we’ve heard simply evaporates. Thorvaldsdottir’s ear is powering the discourse in Hrím just as much as her brain. That idea was thrown into focus in the piece heard straight after it, Kaija Saariaho’s Amers (1992). This is a more imposing score but a less successful one: a small but heavy slab of a concerto for cello, large ensemble and electronics, with Jakob Kullberg the determined soloist. After Thorvaldsdottir’s work, it was notable how Saariaho’s treatment of her instruments strays no further than character cliché. In Amers, a horn brays, a piccolo tweets rococo figurations, a harp tinkles with heavenly innocence and a timpanist pounds alternate drums as if auditioning for Also sprach Zarathustra. Over at Koncertkirken, the Copenhagen Piano Quartet’s late-night concert was shorn of two pieces just before it started, including what should have been its biggest offering, the piano quartet Shades of Silence (2012). As it was, the biggest work we heard was Trajectories (2013), for piano, electronics and Sigurður Guðjónsson’s visuals. The reverberating electronics are based on sounds conceived at a piano and what we saw on film directly matched what we heard: a vibrating surface covered with black particles that tremble together according to the frequency of the sound, glistening like the piano strings that were fingered from inside the soundboard by pianist Rikke Sandberg. Sonically, it is a focused piece. But it could be considered overly long for its material. Reflections (2016) for string trio moved us back from binary sensory clarity to procedural musical clarity. This work once more explores multiple colours despite the textural consistency of three stringed instruments. But it also maintains its strict journey from a single note into a downward spiral that eventually slips down the plughole altogether into silence. After that came Thorvaldsdottir’s newest string trio, in its first performance: Spectra (2017). In her talk with Sangild, the composer described the work as a reflection on ‘alternative realities’. We might have heard that idea in the music’s tendency, over six linked movements, to toy with some other idea far flung from the central musical chassis – among them a little tune that spoke of Nordic melancholy, miniature avian glissandos high in the sky, or a free-flying fantasy that pulled against one of those resolute pedal notes. It felt like a piece that looked skyward from a ground position, firmly rooted on terra firma. But that might be the wrong way around: was this a landscape viewed from above, with the occasional descent into detail and reality? 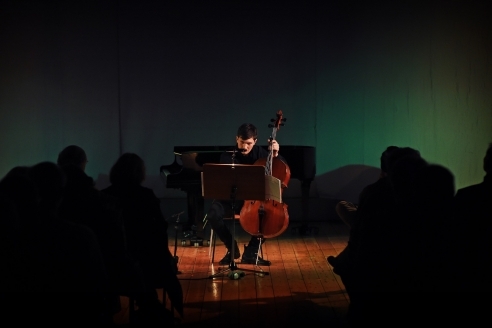 And so to the solo cello of Transitions, played with extreme poise and belief by Adam Stadnicki. The cello is Thorvaldsdottir’s instrument, but she was briefed by New York-based cellist Michael Nicolas, who commissioned the piece, to consider the duality of ‘man and machine’. Thus Transitions is a Jekyll and Hyde work: a one-man scrap between the animalistic and the mechanical, or in Thorvalsdottir’s words, ‘transitioning from one [expressive, emotional] to the other [precise, strict]’. But it seems odd to me that the player is overtly told where these moments of transition occur via symbols on the score; if the music itself can’t tell you, will a nudge and a wink from the composer suffice? Not entirely, is the answer. Again, Thorvaldsdottir achieves much within the confines of a single instrument of four strings: open chords create space; double-stopped glissandos bend horizons into the apparently infinite; consonant harmonies clear the air or draw lines in the sand. But ultimately, the cello has a hard time when it comes to the central conceit (it is one of the least mechanical instruments around) and its physical limitations don’t seem best suited to Thorvaldsdottir’s working methods. Give her a large group of instruments of whatever hue, however, and she’s capable of making anyone feel very small indeed.